리마, 페루의 히치하이커스 리마 로스텔 | 호스텔월드에서 예약하세요. To avoid any kind of inconvenience accept group bookings a month before your stay, one month in advance. Hitchhikers B&B Backpackers Lima Hostel is located centrally and safely, in the best area of Miraflores, close to the ocean (3 blocks), near from the airport and bus stations, among banks, supermarkets, restaurants, bars, discos, places for buying souvenirs and much, much more. 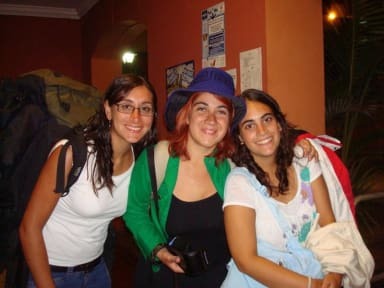 Hitchhikers B&B Backpackers Hostel is located in safely area of Miraflores. We offer you security in the hostel with lockers inside the dorms, a safe box at reception and luggage storage. Our service staff works 24 hours per day in order to provide you the security, calm and information you need, we are at your disposal. We want our guests to have the best stay, and we are sure you will feel like in your own house with our service. We offer a computer with internet access and wireless (Wi-Fi) for notebooks, free kitchen, BBQ area, board games, TV cable, soccer table, ping pong table (table tennis), taxi service, free telephone service, Luggage storage, safety box, personal lockers, books exchange, Tourist information, parking lot for cars and bikes, open areas to drink, eat and talk. We offer private rooms (Doubles, Singles, Twin beds, Triple beds) with and without bathrooms and shared dorms. All our bathrooms have showers and hot water 24 hours.